Siemens, the German multinational conglomerate company, clearly sees the benefits of innovation in the glass sector as it pledges £4m of investment and signs a technology partnership with the British Glass Manufacturers Confederation in Sheffield. British Glasss is a member organisation and a focal point for the industry, providing information and expertise, promoting the use of glass, promoting recycling and stimulating research and innovation. Earlier this year, £5m funding was secured via the Sheffield City Region Local Enterprise Partnership's Growth Deal with the Government to support the creation of a new British Glass Innovation Centre and new training facilities, including a brand new British Glass Academy. The site will provide a centre of excellence for glass manufacturers and support the development of an innovative culture and skills for the sector. The centre, planned to be built on the Phase 2 site of Sheffield Business Park, will include fully functioning glass production plants, as well as promoting leadership in important areas such as new product development and fast prototyping. It will also be home to The Glass Academy, the training and skills development initiative set up by British Glass to train the next generation of engineers and technicians entering the sector, with relevant fit-for-purpose skills and qualifications, and to continue to upskill the industry's current workforce, encouraging a culture of lifelong learning in the sector. The private sector is expected to invest £15m in the British Glass Academy and once at full strength, it will provide 2,000 apprenticeships and qualifications each year. In signing the agreement Siemens will provide a wide range of technical, product and manpower support to ensure British Glass' plans benefit from world-class manufacturing expertise, technical excellence and global sector knowledge. Dave Dalton, CEO of British Glass, said: "Siemens is the first major partner to commit to working with us on the journey to an exciting and highly competitive future. The breadth of Siemens' technical expertise and support offered to us through the partnership will be vital if we are to successfully transform our industry for the 21st Century. In addition, the concerted efforts by Siemens to help us develop the skills of people in the sector, as well as those entering it, ensures we have a powerful combination to push our industry forward over the next five years." Brian Holliday, managing director, Digital Factory - Siemens UK & Ireland, added: "We are delighted to announce this substantial investment in the future of the UK glass industry. We are impressed by the strategic ambition of British Glass to develop an innovative culture and to make British glass-making a globally competitive leader. Siemens has a long established relationship with the glass industry across the UK. By developing this technology partnership, we want to ensure glass manufacturing is at the heart of the manufacturing agenda. 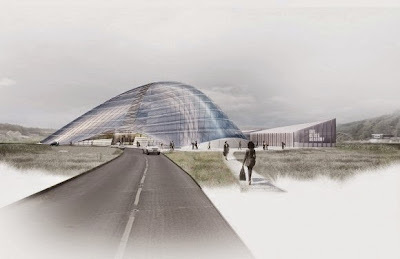 "The newly proposed British Glass Innovation Centre in Sheffield is a prime example where the leaders in the sector are setting out a clear vision for the future and this must be applauded and supported." On the other side of the Parkway from the Advanced Manufacturing Park (AMP), the site of the former Sheffield Airport, construction is underway on Factory 2050, the state of the art, £43m development that is set to keep the Sheffield city region at the cutting edge of advanced manufacturing. The University of Sheffield Advanced Manufacturing Research Centre (AMRC) with Boeing signed a deal to secure 50 acres of land on the park and the first development will be the UK's first fully reconfigurable assembly and component manufacturing facility for collaborative research, capable of rapidly switching production between different high-value components and one-off parts.